08Sep2016 Update: See part 2 here: How to Invest the S.M.A.R.T. Way? The Manila leg of COL Financial’s SMart Investing 2016 was held last Saturday, September 3, at SMX Convention Hall in SM Aura Premier, in BGC. The place was so jampacked, which bodes well for our country, as there are many people who want to learn more about investing. The provincial legs held in Cebu, Davao and Cagayan De Oro were said to be jampacked too. Yours truly was blessed enough to be given front-row seats, as part of bloggers and media group (naks! big thank you to organizers). Plus, I had the awesome opportunity to have lunch and rub elbows with COL Financial President Dino Bate, pique his mind for a few minutes among fellow invited bloggers. Enough about me. The day and the venue were full, there’s so much insights and learnings that I’d like to share with you, so it will probably take 2 to 3 posts to cover most of them. Here’s the first one: Highlights, Quotable Quotes and Notes. The summit started with welcoming remarks from Sir Dino Bate, COL Financial President and CEO. Then Sir Edward Lee, COL Chairman and Founder talked about the importance of financial literacy, focusing on investing in the stock market and the FTSR model in choosing stocks. FTSR stands for Fundamentals, Technicals, Sentiment, and Risk Management (the last being the most important). It’s not fully visible in the picture but I think the source of the model is Caylum Trading Institute. 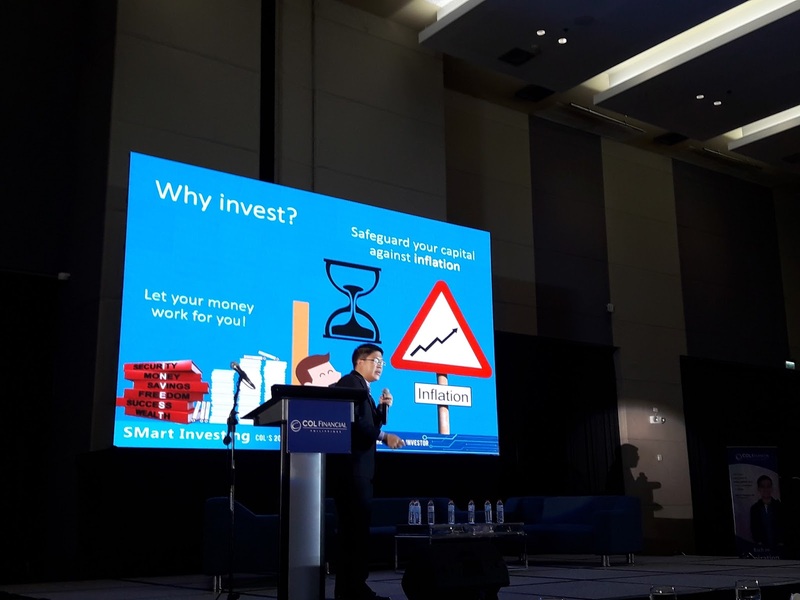 Next speaker was Jed Velarde, (COL Wealth Building Specialist) who talked about investing the smart way, with his own acronym on the word INVEST. He covered time value of money, why investing early (even with small amounts) is important, beating inflation, COL easy investment plan (which for sure is also offered by other brokers you prefer). Will expound on this in Part 2 so do watch out for it. Marvin Fausto, COL Fund Expert and husband of the FQMom, Rose Fres Fausto, followed. Marvin talked about the mutual funds that may be bought using COL Financial platform, the growth story and prospects of the Philippines, the proper asset allocation according to one’s age, etc. 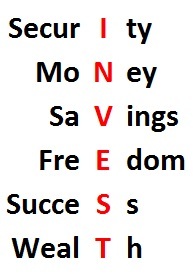 He also had his own acronym, this time the “SMART” in smart investing, which again I will expound further in part 2. He then lead a panel discussion with top fund houses, namely ATRAM, BPI Investment Management, First Metro Asset Management (FAMI), Philam Asset Management, PhilEquity Management Inc, and Sun Life Asset Management. Not to take away anything from the other fund houses, but I was just star struck to see Wilson Sy (PhilEquity) and Gus Cosio (FAMI). Too bad I was not able to get their autographs. After lunch, COL investment goddess April Lee Tan (Head of Research) took the stage to talk about the fundamental outlook of the country and the stock market. She covered GDP forecasts, BPO contribution, OFW remittance, the favorable demographic window that might last until 2055, the socio-economic agenda of the new administration, etc. She also shared a thematic COL Stock picks based on the industries they foresee to benefit in the Du30 administration. Afterwards, the major co-sponsor SM Investments Corporation (PSE: SM) also talked about their company prospects in general, their plans, as well as further details from their major companies: BDO, Chinabank, SM Retail and SM Prime. Despite being giants and market leaders in their own fields, they still see so much growth potential in the country, especially in the Visayas and Mindanao areas. They also expect to benefit from PPPs (funding), reclamation (once approved) and REIT (once approved). Juanis Barredo, COL Financial Chief Technical Analyst presented last with his technical analysis on the PH market, major US indices, as well as select PSE stocks. A fun Q&A session (and raffle draw) capped the fully-loaded summit. Believe in the power of investing. The stock market is the best place to make your money work for you. Safeguard your capital against inflation. Inflation robs you of your money while you sleep. Time, not timing, is our ally. When you start making money in stocks trading, you feel good and confident, you may be tempted to gamble more, it becomes indirect gambling because you want to make more money. Volatility is the new normal. Run your stock portfolio like a business; invest based on your goals. If you don’t invest, you don’t care about your future. Discouraged to invest? You’re actually depriving yourself. Financial freedom is having enough to help other people without worrying for ourselves. Rosy economic picture for PH, demographic window, OFW remittance, BPOs, increased infrastructure spending. Biggest risk they see is political risk. People are being too optimistic about the future, pricing in so much expectations and lofty valuations. What if the promises are not delivered? Failed expectations? Unpredictable policies? Misinterpreted / impulsive pronouncements? But this risk, if it so happens, should be an opportunity for the young to participate in the market. Retail investors are more sticky, more long term, not prone to fund pull-outs (Geri: Probably because they have little capital to begin with and less alternatives), unlike the experience in big funds. COL has 190K customers and growing; less than 1% of Filipinos invest in the stock market. 70% of PH economy is consumer spending. (Geri: This is what SM is focusing on). SMIC eyeing growth in provincial areas, SMEs, microfinancing, REIT. Watch out for more details in the coming days (or weeks if I’m too busy). Find more pictures of the event in our Facebook, Instagram or Twitter. Not yet a member of our mailing list? Checkout Truly Rich Club to get more guidance on stocks investing, as well as spiritual wealth. Enjoy the many benefits like I do. Lastly, want to support our cause and advocacy? You may want to donate through Paypal. Every Juan deserves a richer life! God bless! Nice! I wanted to join it as well, but I was in the province during the event. Great article by the way! It's a nice peek of what they discussed there. Thanks for the kind words Ray.